Through the eyes, words and songs of its popular music stars of the 50s, 60s, and 70s, DON'T THINK I'VE FORGOTTEN: CAMBODIA'S LOST ROCK AND ROLL examines and unravels Cambodia's recent tragic past. 'Searching for Sugar Man' and '20 Feet From Stardom.'" A rich and defiant effort at recovery, showing that even the most murderous totalitarianism cannot fully erase the human drive for pleasure and self-expression. Every bit as entrancing and haunting as the lost music it celebrates. A rich patchwork tapestry of powerful and ebullient music. If Don't Think I've Forgotten is any indication, this Southeast Asian country has a lot of soul. Very good and moving. Deserves the widest possible audience. A fervent cry for the power of music. The music, the stuff of cultish collectors for decades, is thrilling. Resurrects and revives this ghost music, breathing life into it once again. Does more than document a lost moment in timeâ€”it may also generate new knowledge and connections through its circulation. A moving and valuable project. Essential. You'll never understand the soul of a people without taking a long, close look at their cultural life. A musical restoration of the country's history, a celebration of art, and an homage to those who paid for it with their lives. There is a universal appeal. A poignant and important reminder that art matters. Heartbreaking. A tough but uplifting reminder that no matter what awful things humans do to each other, art survives. What a bold feat of a film this is! If you love music...then you need to see this film. Beautiful, atmospheric and most of all lively. A brilliant cultural excavation, connecting survivors' memories to a generation's worth of energetic music. The sheer range of music on offer is astonishing. More than a music documentary. Makes the whole period come alive. Carries with it a sense of discovery so profound it's practically archaeological. Engaging and detailed. A kind of cultural restoration project. What makes this film unique â€“ and uniquely powerful â€“ is its detailed account of the richness and vitality of the culture that was all but destroyed by the Khmer Rouge. This film is captivating, moving, and informativeâ€”it's an outstanding production. A powerful film about the enduring legacy of a culture's music even in times of severe repression, this is highly recommended. A huge revelation for the music history books...Provides a completely refreshing new perspective. Riveting. At once exotic and familiar, intoxicating and revelatory. A poetic remembering of a culture lost during war. Serves as an ode to gentle, loving people who suffered terribly, but somehow have kept their spirit. This story needs to be told, and this music needs to be heard. Stunningly told and peerlessly edited. Lush with gorgeous sights and sounds. A celebration of music's resilient, lingering power. A fascinating, beautifully realized story that urgently needs telling. An irresistible documentary exploration of the wonderfully lush and occasionally psychedelic popular music produced in Cambodia. Pirozzi gets it right. [The film] assists in deepening the humanity and underscoring the richness of Cambodian culture. A labor of love that shines the spotlight on performers who made great music and whose legacy was almost erased. Crucial. A testament to human resilience. This is a fantastic film then, filled with terrific music and colourful characters, all tied together by an astute journalistic heart. Any admirer of historic footage will love the jewels to be found in this film. A giddy whirlwind...tons of vintage footage. Cambodia's music scene had plenty to offer. Employs clever animation and colorful sequences to capture the energy of the rock scene. Reminds us of music's essential role as cultural unifier. This film does a great job capturing this little known gem of history. A glowing tribute to the universality of art. That the documentary exists at all is a triumph. Personal and detailed. This project was an extensive undertaking. Remarkable. The footage is a revelation. The country's music scene was specialâ€”a vital force in a rapidly changing nation. The sound is thrillingly new for American audiences. Revives a lost art. Bracing. Sometimes a music documentary reaches a state of transcendence. John Pirozzi's new film is that kind of movie. Paints a picture of...Phnom Penh as a vibrant city teeming with garage bands and rebellious rockers. Patches together the vibrant, fraught history of the Cambodian rock and roll scene. 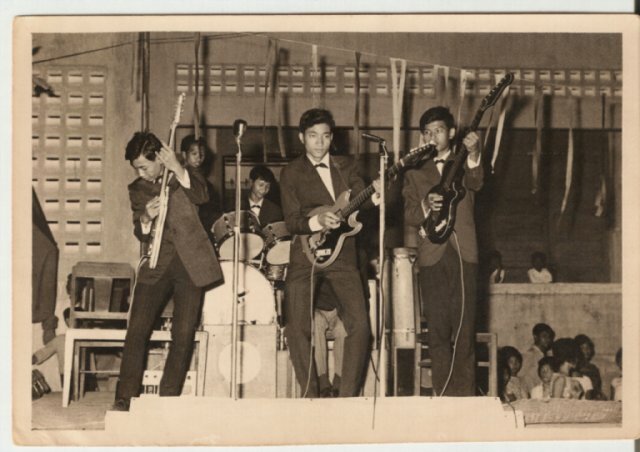 A spellbinding survey of Cambodia's lost era of psychedelia-infused lounge rock and roll. A high watermark of investigative journalism. Goes beyond the sounds themselves to weave an emotional tale of how important music is to a society. Does the world a service in documenting the era. You can't help but marvel at the power of (music) to sustain itself through the people who made it, and those who love it. Part historical document, part celebration of a nearly lost form. Wonderful trove of well-edited archival footage. Expertly weaves Cambodian history and political strife through the lens of rock and roll. An essential document for anyone with an interest in the history of popular music from around the world. Explores the unique fusion of sounds coming out of Cambodia in the 1960s and 1970s.